First it was potatoes. Now it’s pizza. The processed food industry is reaching out to its friends in Congress to scuttle new USDA guidelines that were supposed to make school meals healthier. Politico reports that House and Senate negotiators are likely to approve agriculture appropriations language that would allow the tomato paste on pizza to be counted as a vegetable serving under the USDA’s new school meal guidelines. Count this as the result of lobbying efforts by processed food giants ConAgra and Schwan Food. Schwan is one of the world’s largest purveyors of frozen pizza and pitching for its sauce is Sen. Amy Knobluchar, Democrat of Minnesota, where Schwan is based. The new pizza rule comes quick on the heels of a Senate amendment prohibiting the USDA from limiting the amount of potatoes served in school meals. That was pushed by senators from potato producing states Maine and Colorado. These latest broadsides against the USDA rule-making process–inserting Congress as micro-manager and protector of economic interests over kids’ health–point up the pitfalls of trying to use meal standards written in Washington as a way to dictate what kids eat. It also provides a vivid illustration of what happens when you go after the foods kids most love in the lunch line. Pizza is the all-time favorite school lunch food, followed by potatoes in all their guises. Essentially, the proposed new guidelines would sharply cut back on foods kids really like, and replace them with things they hate: vegetables, beans and whole grains. Turns out there are huge amounts of money at stake behind the foods beloved by the 32 million children who participate in the national school lunch program. Frozen food companies are protecting their share the best way they know how: using their clout with their local congressman. Ironically, it was Congress back in 2004 that called on the USDA to re-write the nutrition guidelines for school meals so that they would align with the Dietary Guidelines for Americans, which call for more balance in the way we eat. In other words, fewer potatoes and more vegetables, legumes and whole grains. The USDA contracted the work of writing those guidelines to a scientific panel at the Institute of Medicine. The IOM’s guidelines were first released in October 2009. The USDA now is in the process of writing final new rules, to go into effect possibly in the fall of 2012. Other efforts to mess with pizza also have failed. In Berkeley, for instance, elementary school children get a rectangular pizza made with a locally-produced whole wheat crust. 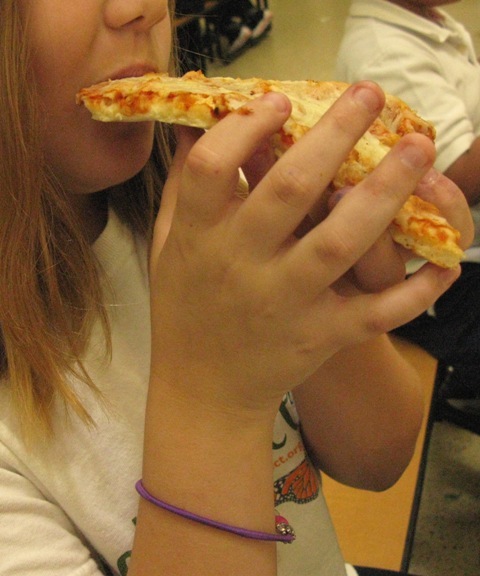 Middle schoolers, however, insist on a round pizza, which has to be sourced through a wholesale food distributor. But Berkeley found a way to make the sauce healthier by cooking it from scratch using all kinds of vegetables in addition to tomatoes. Last I checked, pizza was still being served twice a week in Berkeley schools, and that was after famed school meal reformer Ann Cooper took over. Cooper tried to remove nachos from the menu entirely. But she was forced to reinstate them in a healthier version–meaning no processed cheese out of a can–after students went on strike, refusing to eat in the cafeteria. As I’ve learned sitting in on meals at my daughter’s school the past two years here in the District of Columbia, children will go to great lengths to avoid the foods adults consider “healthy.” Vegetables, beans and whole grains–they typically get dumped in the trash. Kids will spend inordinate time picking the spinach out of fresh-cooked lasagna, for instance, before wolfing down the pasta. Since most schools no longer cook food from scratch, the frozen food industry has gained a huge stake in what children eat at school. Politico reports that “both Schwan and ConAgra have quietly helped to finance the ‘Coalition for Sustainable School Meal Programs’ which maintains a red-white-blue – and yes green – website with the heading ‘Fix the Reg.’ ” Illustrating just how mixed up and incestuous the business of feeding children has become, the coalition is being managed, Politico reports, by Barry Sackin, a former longtime lobbyist for the School Nutrition Association. The SNA, while claiming to represent the interests of children and thousands of the nations school food service directors, is driven by money from the processed food industry–including Schwan and ConAgra. The last time we talked to Sackin, he’d been barred from a conference hosted by the American Association of School Administrators. The Service Employees International Union, which also got the boot, had enlisted Sackin to give a presentation on how schools can better deal with food rebates in their contracts with food service companies. Corporate sponsors of the event–which included Aramark and Chartwells–objected. Apparently, Sacking plays for both sides. Like other processed food purveyors, Schwan and ConAgra spend enormous sums as “rebates” to entice schools and food service companies to place their products in cafeterias. As I reported recently,ConAgra placed seventh and Schwan eighth among companies that paid the most in rebates to Chartwells as part of its contract to serve kids in D.C. Public Schools. This is why my kids still take there lunch to school. I will allow them to have one lunch at achool a week of there choice, so they do not think they are being picked on. I will cut up apples and fruit with low cal dipping sauces (to get the 7 year old to eat it) and actually had the school tell me not to send it, because it wasn’t fair for the others kids not getting it. I still send it!!! First they feed them trash then they tell me to send trash for them to eat?!?!?! What is the propblem with? I still send them with healthy lunches but ones that they will eat. The U.S. has a very strong tradition of free choice and self reliance, so kids are allowed to bring almost anything from home into the lunch room. In my experience what they bring is often much worse than what the school is serving–cookies, candy, chips, soda. This isn’t the case in other countries. In France, for instance, you are expected to either eat the lunch provided by the school, or go home for lunch. (The have a very long lunch hour.) In Sweden where I recently visited, a very small percentage of children decline the free lunch and they do not eat in the caferia with the other kids. In other words, in those countries the integrity of the school meal is highly valued, while in the United States if faces competition from all sides. No wonder it is so little valued. But that is a kind of chicken-and-egg question. Perhaps if the food were much better, parents would place a higher value on the school meal program and would be less inclined to send food from home. That’s precisely the battle Ann Cooper in fighting in Colorado, where so few of the kids are eligible for free or reduced-price meals. She serves great food, but has to convince parents to pay a premium for it. This kind of thing makes my head explode. I never used to think that there would be an upside to my child’s life-threatening food allergies, but it turns out that being unable to eat school cafeteria food is to his benefit. If you’ve never sat in on a school lunch, it’s a shock. The noise level is overwhelming, and it’s a fairly evenly matched contest between the cafeteria and the lunch packing parents as to which of them puts unhealthier food in front of the kids. The amount of waste, both of leftover food and (meant to be thrown out) food packaging is simply stunning. The only good thing to come out of this debacle is that the lawmakers have practically served up a written confession as to who they consider their constituency. I hope this bites them back come election time. Libby, I’d say you are right on in every respect. And, yes, I’ve sat in on meals at my daughter’s school more times than I can count and the conditions are exactly as you’ve described.